Shopriders 889DXS which we now call the Monza has been the leading class 3 scooter in the UK for many years. 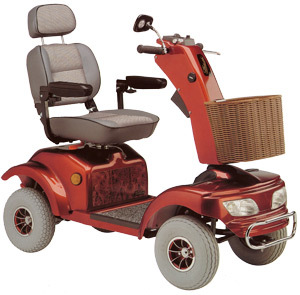 This attractively designed well proven scooter is fitted with a full light set which includes front and rear lights, indicators and hazard flashers. A hand brake for parking and for use in an emergency is also provided together with a horn to warn others of your presence. A flick of a switch is all that is needed to increase the Monza's speed from 4 miles per hour to its maximum speed of 8 miles per hour. The basket which fits to the front tiller is able to take quite large amounts of shopping. The Monza is a very robust scooter, the 13" wheels and all round independent suspension ensure that users always experience a comfortable ride. The deluxe Captain seat adds to the ride quality, long distance can be covered without dis-comfort ensuring that you arrive at your destination in the best possible condition.